Rants and musings from someone who was meant to teach, but only those who want to learn. We have a reservoir with a community beach very close to our house- totally within biking distance. (I know, everything’s in biking distance if you have enough time) but this one really is- literally a ten minute bike ride. We are also within a mile of a grocery, a small hardware store, a coffee place and a thrift store. And a farmer’s market. I shouldn’t be driving to those places either. But again, the baggage problem. Backpacks are okay, but they make me hot and sweaty, and commercial panniers cost more than I want to spend, so I decided to make some. What separates panniers from just a regular tote bag is that panniers are bags that have a rigid, or semi-rigid side, that hook onto the rack on back of my bike. The interwebs have lots of tutorials on how to make your own, using army surplus bags or cat litter buckets. Not exactly the look I’m going for, though. I got a yard of natural denim, and 1/2 yard of super cute oilcloth. Actually the oilcloth came first, I got it on impulse because it was so super cute, then thought of it for the pannier project. The oil cloth will make the bags splash proof, but not really rainproof. It doesn’t rain here much anyway, and honestly, when it’s raining, I’m in the car. Wimpy, I know. Look how cute it is! I spent about $15 on fabric, and another 5 on hardware. The bags will wind up being fraternal twins, rather than identical, because as I made the first one, I figured out an easier way of constructing the second. It also winds up being smaller, though. I thought of ways to make these with pre-made canvas tote bags- it would probably be cheaper as well as taking less time. I had plenty of time to think about this as I changed the burnt out light bulb on my sewing machine. (is that the difference between really expensive machines and cheapo ones like I have? On a $1300 sewing machine, do you just flip open the side and pop out the light bulb? On mine, I have to unscrew a thing on the back, pull the plastic panel off the front, get my fingers in there and unscrew the light bulb, and there is a plastic flap right at cuticle level that scratches every time the bulb goes around. It’s awful! This is a very basic bag with a flap, and parachute clips to close it. The key to making the bag work as a pannier is to add another layer of fabric so there is a pocket for a rigid piece of plastic or thin wood to screw the hooks onto. In my case, I sewed the bags from scratch and added the layer of oilcloth as the extra layer, but it probably could be done with tote bags you have sitting around the house. I found thesereally good instructions for doing the hardware. 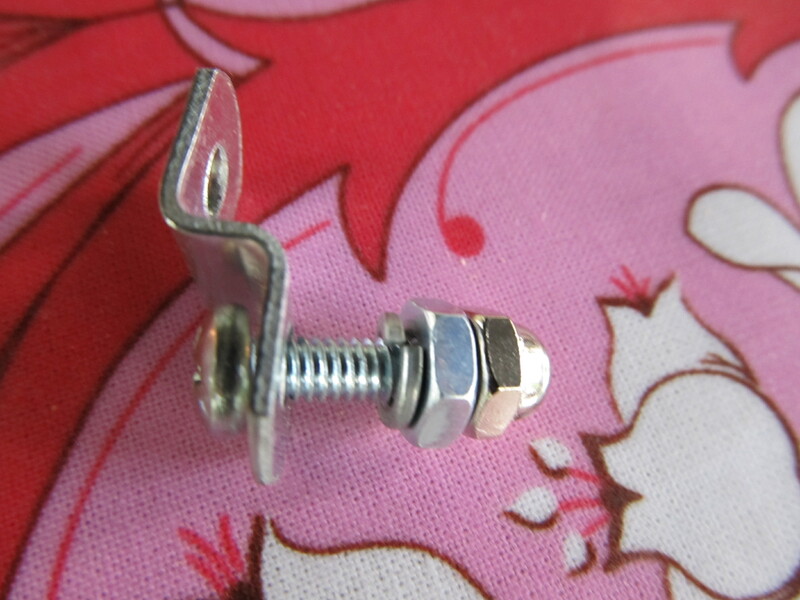 Mirror clip, machine screw, split washer, nut and acorn nut. I used a piece of 1/8th inch thick hard board that I had in the garage from another project (as always) that I cut to 12″ by 12″ and slid into the pocket. Then I attached mirror clips, from the hardware store with machine screws and nuts and stuff. I actually wrote down what I needed, as found on the link above, on a post-it and biked to the hardware store. Then I found a guy in an apron and thrust the post-it at him. “I’m making bike bags” I grunted. He found all the bits and pieces for me. 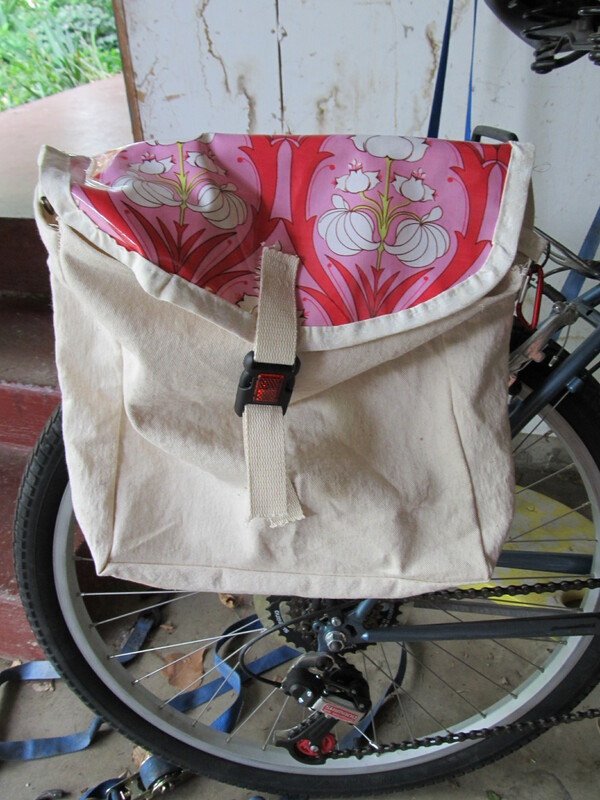 Bag number 1 fits great- now to finally change that bobbin and finish bag number 2- then it’s off to the farmers’ market.